45 degree Mid depth blade runs 2 feet to 4 feet. 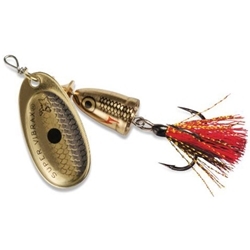 The patented two-part body emits low-frequency sound vibrations that attract fish and trigger strikes while virtually eliminating line twist. Calf tail mixed with shiny colored fibers hackle adds to the attraction.